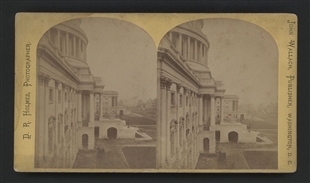 The Columbus Doors—also called the Rotunda Doors— in this stereoview were installed at the Capitol's main entrance on the east front in 1863. 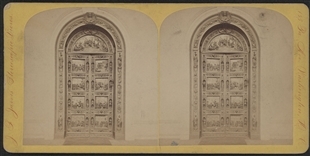 The 17-foot high bronze doors were designed by sculptor Randolph Rogers, and depict scenes from the life of Christopher Columbus. A bust of Columbus surmounts the pinnacle, and Native American headdresses, emblems of conquest and navigation, and allegorical figures ornament the border. 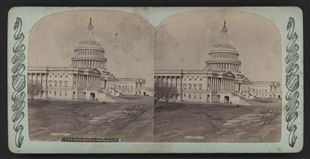 This stereoview of the impressive entrance is one of many images of the Capitol produced as souvenirs by J. Jarvis’s Photographic Emporium, which was located a block away from the Capitol.